Besides being a Desert Southwest Santa Fe style design, this landscaping was also designed for erosion control of the foundation of the home. It is a plan created out of necessity. The left side of this lot is 22 inches lower than the right. Therefore, there was a 22 inch high exposed bank of soil on the left that has eroded to within inches of the foundation of the home. This xeriscape had drainage and erosion issues. Not only did the lot slope from right to left, but also sat level from front to back. So, even though the water from the roof was eating at the foundation, the fallen water had no where to drain out into the desert. What we did first was create a terrace of the lot by building a 22 inch retaining wall of pre-fab blocks on the left side of the home and filled it with soil. This brings the lot level where the house sits. We then covered this area with weed fabric, decorative stones, and xeriscape plantings. Next, in order to create drainage, we built a very small high spot in the center of the lot from front to back so that the water can drain both ways. We did it this way because a slope from one end of the home to the other would either expose the foundation too much or raise the soil above the foundation. We then created a pleasing design by building a retaining wall in front that is an extension of the one on the left. The two walls line up as if they were continued across the driveway. This helped to "frame" the most visible part of the home. NOTE: The small wall in front also holds a 10 inch slope in place. 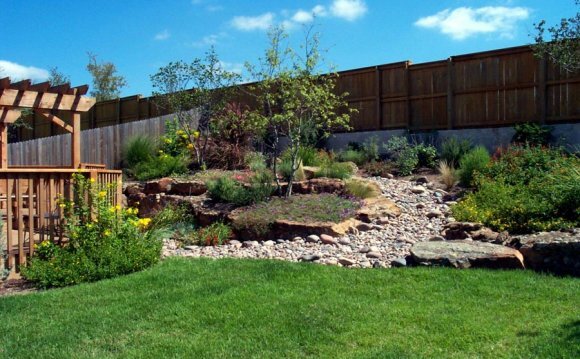 We used two different types and colors of decorative rock in this desert landscaping to create contrast, shape, and design. One is dark red and the other is white. Also, the retaining wall is light adobe. These colors will create a pleasant, not too loud contrast. The plantings are of few varieties placed in groups of threes or masses. This displays the principle of simplicity. Remember, that in this type of landscape design, a few well placed varieties gives more impact than a mix-match slew of plants. All areas are under lain with professional weed fabric which will also help with erosion control on a sloped lot and there is an automated, precision drip system installed.